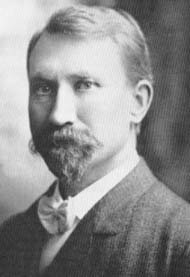 Although not a man who attracted much attention as a theorizer, Rydberg was an energetic field biologist and meticulous (if somewhat radical) taxonomist whose efforts made him perhaps the foremost expert on Rocky Mountain and Great Plains floras. These days his most cited works are his Flora of the Rocky Mountains and Adjacent Plains and Flora of the Prairies and Plains of Central North America, but he also produced several other memorable "floras," as well as numerous reports and taxonomic reviews--in all, in fact, he is reputed to have described some seventeen hundred new species. For his later works Rydberg contributed all his own illustrations. --born in Odh, Vestergötland, Sweden, on 6 July 1860. --dies at New York City, on 25 July 1931. --Dictionary of American Biography, Vol. 16 (1935). --Per Axel Rydberg: A Biography, Bibliography, and List of His Taxa (1990).